6 Bedroom Detached House For Sale in Dronfield for Offers in the region of £700,000. View the virtual tour of this stunning 6 bedroom property with its own gym and entertainment area! 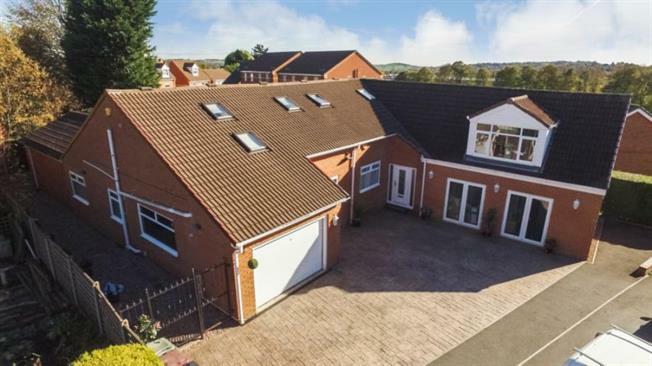 It is an outstanding and impressive six bedroom detached property which is beautifully presented and offers modern, spacious, flexible living accommodation. On entering the property there is a door to your right which opens to a leisure suite over two floors. This could easily be converted into a separate annexe (subject to necessary consents). To the ground floor of this is a built in cocktail bar and cloakroom with low flush white suite making this an ideal self contained area for entertaining. On the first floor is a room used as a gym that has velux roof lights and spot lights to the ceiling. From the entrance lobby there is a walk in cloakroom with ample storage. The lounge has patio doors and windows to the rear of the property. Leading from the lounge is the dining room with patio doors and the impressive breakfast kitchen. This has an extensive range of wall and base units and high quality built in appliances. There is an island unit with space around it for seating and set into one side of it is a six ring gas hob. The utility room provides additional storage with built in wall and base units with plumbing for an automatic washing machine. A light and airy conservatory offers flexible use and has French doors to the patio and garden area. On the ground floor is an inner hall leading to the bedroom area. The attractive Master bedroom has French doors opening onto the patio. It benefits from its own walk in dressing room, en- suite shower room and make up room. There are three further rooms two of which are bedrooms and one currently being used as a study. The luxury bathroom has recently been refitted. A staircase then leads to two further bedrooms each of which has its own en-suite bathrooms. Outside to the front of the property is a patterned concrete driveway with ample parking and access to the integral garage. To the rear of the property there is a large patio area again great for entertaining and a level lawned garden with summerhouse and timber shed. Only upon an internal inspection will the true size and extent of the versatile living space it has to offer, be appreciated. There are a number of leisure items and furnishings that will be open to negotiation.